With the season drawing to a close, Everton hosted their annual awards evening on Thursday evening, with Leighton Baines the main winner, on a night dominated by the impending exit of manager David Moyes. 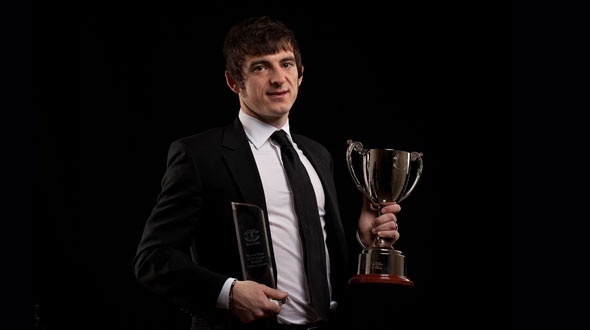 After enjoying another excellent season in which he cemented his place as the best left back in the Premier League, Leighton Baines was crowned the supporters player of the season and the players player of the season. The only real surprise was his failure to make it a hat trick of awards, with his quite superb free kick against Newcastle overlooked in the running for the goal of the season. Kevin Mirallas picking up that award instead, his first as an Evertonian, for his brilliant solo goal at Goodison Park against Stoke. Few could argue with the crowning of Leighton Baines. His levels of consistency have been extraordinary and he has added regular goals to his play and his already outstanding quantity of assists. His link up play with Steven Pienaar has been exemplary, with a number of pundits now recognising the Blues left-sided duo as the best in the business. Gary Neville may have highlighted to the watching nation, Baines’ almost unique ability to under-lap the winger, but this hasn’t lessened his threat, with opposition managers struggling to remedy the significant threat possessed by the ex-Wigan full back. The challenge for the incoming Everton boss, whoever that may be, is to retain the services of Baines for the years to come. Baines is a proud Evertonian and as a Scouser, knows what it means to represent a club of Everton’s stature. His future at the club should not be taken for granted and as he looks to establish himself as England’s first choice left back, Baines will be looking for assurances that Everton will continue to progress in the absence of David Moyes.